A beautifully textured cake that's great for large gatherings because it’s a generous size and cuts like a charm. A warmly spiced dessert to feed a crowd. When I was growing up we used to hide the house key in the clothespin box at the back door. But at some point it was decided that was far too obvious so for a while we had a fake rock with a key slot in it. After that we went through a stage where we’d climb in the sun porch window which was an effort because it was simply a big swinging window in the middle of a whole wall of windows. It was up high and had no ledge so you’d have to hoist yourself up and balance carefully until you could get a leg swung around in front, a great challenge in a dress. The sun porch window didn’t work when cold weather arrived because the sun porch was more or less closed off from the family room so dad devised a brilliant way to get in the basement door. That door locked on the inside with a huge sliding bolt. Dad drilled a hole, not much bigger than a chopstick, straight through the wall, lining it up perfectly with the bolt. We left a long metal rod outside the basement door and if we were locked out we’d poke the rod through the hole until it hit the sliding bolt and knocked it to the floor. That was dad’s wizardry. Mom’s magic has always been gathering us around the table, and ensuring every meal has a sweet ending. 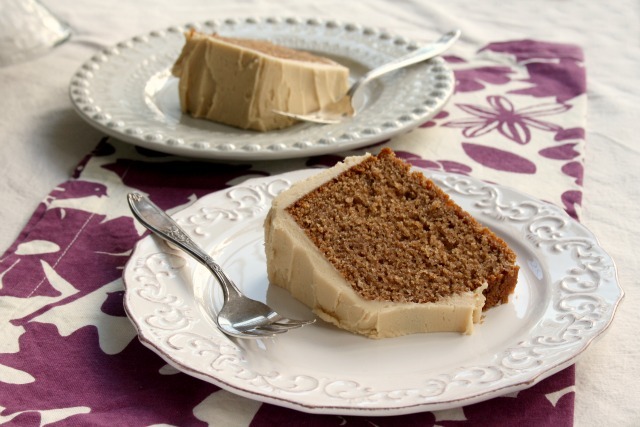 Mom’s warmly spiced buttermilk clove cake is a perfect cold weather dessert. It’s beautifully textured and great for large gatherings because it’s a generous size and cuts like a charm. 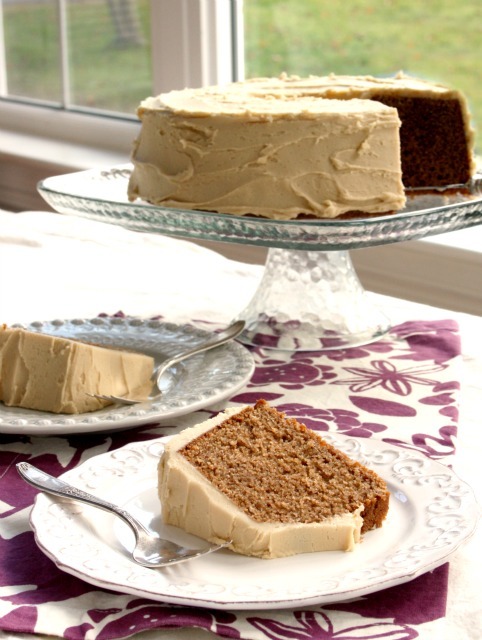 The fudgy frosting makes it extra special and is a good balance for the spiciness of the cake. A simple of dusting of icing sugar would be good too. This incredibly moist can last a week on the counter if covered. I make this cake with stone ground whole white flour or light spelt flour. 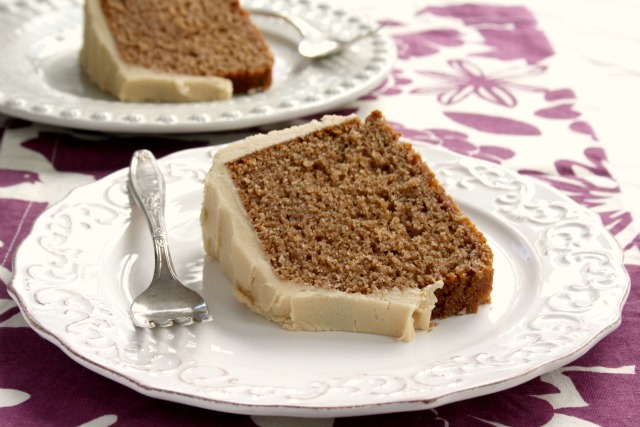 Stone ground flour adds incredible flavour and texture to this cake. Look for flour made from locally grown wheat in your natural foods store. Preheat oven to 350 F. Grease and flour a 10” bundt or tube pan. In a medium bowl whisk the flour, spices, baking powder, baking soda and salt. In a large bowl cream butter and sugar, then beat in eggs one at a time. Add flour mixture, alternating with the buttermilk, and combine well. Spoon into prepared pan and bake for about 75 minutes, until the top springs back when lightly touched and a tester comes out with just a few crumbs attached. Set on a wire rack and let cool in pan 10 minutes before removing from pan to a cooling rack. When completely cool coat with frosting below. Melt butter over medium heat. Add sugar and cream. Bring to a boil. Boil one minute, stirring then remove from heat and cool. Beat in sugar and vanilla. Is Canned Tuna Safe to Eat?